My decor style changes from house to house and our current abode is definitely rocking a coastal modern vibe. Coastal Modern meaning it's not too beachy/themey and modern in that I mix in metals like brass and gold with unexpected elements like acrylic and marble. By blending the two styles, you get a calm, fresh mix that keeps a home bright and airy with a bit of an edge. 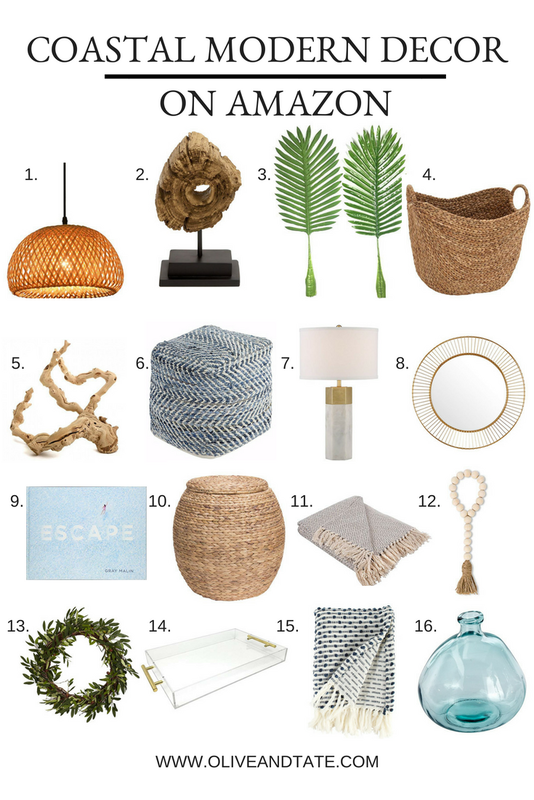 Recently, a reader requested that I post my fave budget home finds, so I hit Amazon to find the best Coastal Modern accessories on the internet. Each piece is one that I would use in my own home (and some already live here!) and will lend a natural vibe to your decor! You can shop all of my Amazon decor faves here or via the links below! 1. Woven Pendant Light: this pendant light looks super similar (almost identical!) to the woven pendant I snagged at IKEA so if you're not in an IKEA adjacent neighborhood, take this one for a spin1 It creates a super pretty shadow pattern with warm tones through the woven, natural shade. 2. 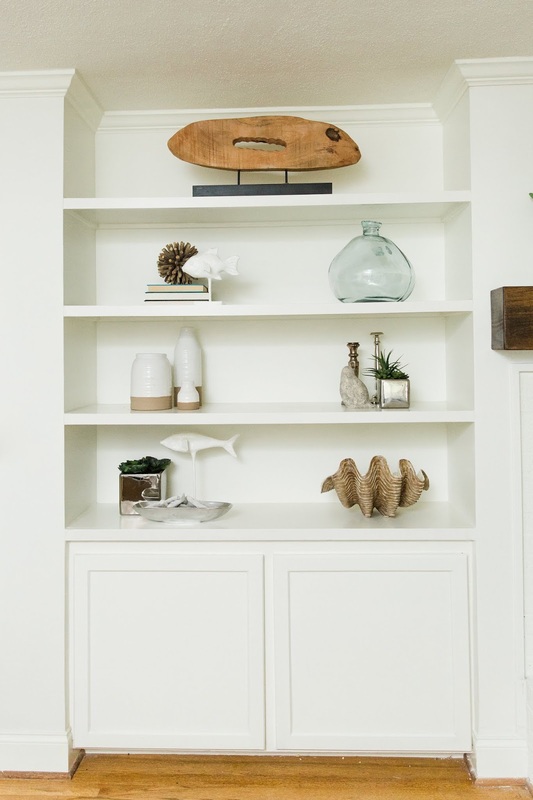 Wood Sculpture: Perfect for shelf styling or to display on an entertainment console, a natral wood sculpture brings in an Earth element that grounds the lighter colors typically associated with coastal decor. 3. Faux Palm Fronds: Palm Fronds are having a moment! This multi-pack is a steal and the size of the fronds will take up a generous amount of visual space in your design. 5. Olive Wood : Olive wood has such an organic shape that it's hard to replicate - if you're stuck with an awkward shelf or nook that needs a special piece, I'm all for an Olive Wood display! 6. Pouf: I consider the pouf to be one of the most versatile pieces of decor for a family home. We stash two under our coffee table and use them for additional seating, as foot rests and to build pillow forts. I particularly love the shades of blue in this super well priced number! 7. Marble and Gold Lamp: I love the natural look of the Coastal vibe but I can't leave my modern elements behind. Adding in accessories like a marble and gold lamp with fun geometric angles will ensure that a coastal theme doesn't head into '80's beach house territory. 8. Gold Mirror : Perfect for over the fireplace or in an entry, the gold border elevates this mirror without competing with the rest of the space. 9. Beaches Coffee Table Book: from the Coastal master himself, the Gray Malin coffee table book is a must. 10. Woven Lidded Basket/End Table: a small space miracle worker, a lidded basket that can serve as an end table is the perfect way to combine function with style. These are perfect for a play room or family room! 11. Tassel Throw: the soft pattern and shades of blue-ish grey are perfect for a coastal but cozy vibe. 12. Wooden Beads: a major trend happening right now is the string of wooden beads - and this set comes with three strands for less than $15! Style them on a lucite coffee table tray, paired with a coffee table book for an easy vignette. 13. Olive Leaf Wreath: Don't forget to bring in shades of green to keep coastal decor fresh and vibrant. A simple wreath in an organic shape is an easy way to work in the color without breaking the bank. 14. Lucite Tray: Don't be afraid to mix in lucite elements with coastal decor! I love how the sleek lines balance the natural shapes and colors of driftwood, sea glass and woven elements. 15. Throw Blanket: can you ever have too many throw blankets? The weave of this one is super funky and will bring in a fun pop of pattern to a neutral sofa or chair. 16. Sea Glass Jug: One of my fave elements to use in my own shelf styling, I actually have two different sea glass jugs in my Family Room and love the shade of blue they bring into the space. 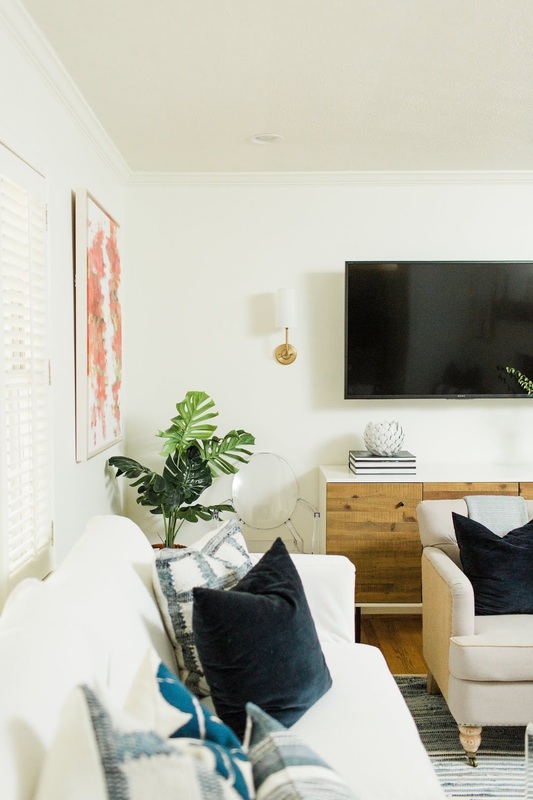 See the entire Family Room Before and After here!